bluto (2 years ago) Inappropriate? For which figures are these morphs? ssgbryan (3 years ago) Inappropriate? Thank you, I can always use more Trek Morphs. bluto (4 years ago) Inappropriate? ok ... and for what figure are these morph? Awesome, thanks for all the morphs! bluto (6 years ago) Inappropriate? fretslayer , the jem hadar horns or spiles or what ever they are are in the props folder under trek , bluto . Fretslayer (6 years ago) Inappropriate? How do I get the spikes on the Jem Hadar? donfield (6 years ago) Inappropriate? 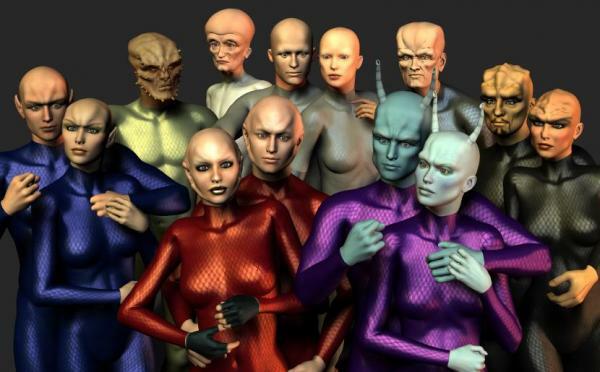 One can never have enough weird-forehead aliens. Thanks! Very cool, dare I say, Awesome! kirtemor (6 years ago) Inappropriate? i'd like to request a cardassian, a ferengi, and a few of the other races from star trek for v4/m4 that aren't in this great package! please and thank you. NV Oracle (6 years ago) Inappropriate? Oh, cool. You finished these. I've been gone for a few days, and I wasn't sure if you had posted them. They're beautiful morphs, Bluto. Thanks for posting them, from me, too. This is frigging brilliant! Thank you! aiel777 (6 years ago) Inappropriate? Magic Bluto, Did you ever manage to do Balok? Anna Elkins (6 years ago) Inappropriate? Are these for Daz Gen4 characters or Genesis? This is an outstanding collection of morphs! Thank you so much for sharing it with us! ludoed (6 years ago) Inappropriate? clioschrotter (6 years ago) Inappropriate? Wow, finaly some morphs I was lookong for for a long time - thanks a lot! Are you able to create thesse, too? That would be great! Heh, heh...looks like MasterChief thanked you for every species represented. Seriously, some very skilled efforts depicted. Great to see two of the "classic" designs, the Vian and Talosian, included. Uh, weren't you working upon a Tellarite at some point? masterchief (6 years ago) Inappropriate? Thanks Bluto these are outstanding! Thanks for the share, these are some really amazing morphs! serioussam909 (6 years ago) Inappropriate? Wow, this is great. Thanks so much. MotoTsume (6 years ago) Inappropriate?